There are two types of disposable and exchangeable chips for analysis and sorting of cells. maximum sample volume 300μL, maximum sheath fluid volume 9mL. Flow channel dimension 80μm x 80μm for sorting of cells and particles up to 60μm in diameter. maximum sample volume 1000μL, maximum sheath fluid volume 9mL. 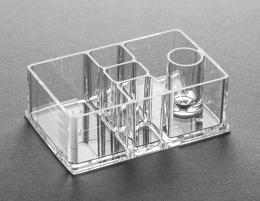 Flow channel dimension 150μm x 150μm for sorting of cells and particles up to 140μm in diameter.